The iconic Surfers Paradise Metermaids were introduced by the now defunct Surfers Progress Association when in 1964 the then Gold Coast City Council introduced paid parking into Surfers Paradise, requiring visitors to the then beach side tourist destination to pay for the time they parked their cars on the Surfers Paradise streets using parking meters. The local traders were so concerned that the requirement for 5 cents an hour parking would scare away the weekend tourists from Brisbane that something needed to be done. 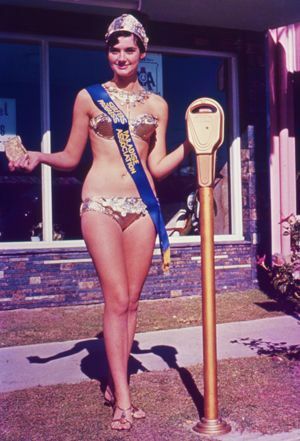 The brain child of local trader Bernie Elsie was to introduce “courtesy maids” who would walk the streets of Surfers Paradise dressed in golden bikinis and wearing jewelled tiaras, feeding the parking meters. Hence the now iconic Surfers Paradise Metermaids were born and have since 1964 continued to feed the parking meters in Surfers Paradise, preventing an estimated ½ million dollars in parking fines and paying for millions of visitors for their parking when they park their car in the streets of Australia’s premier tourist destination. When paying for the parking for a tourist’s car, under the windscreen wiper is left a small courtesy brochure advising the car owner that they have just been saved from a parking fine. That brochure has over the years been a source of information of businesses in the Surfers Paradise precinct as well as a means of local businesses, the council and Surf Life Saving Australia to communicate offers, information and events. Despite a common misconception, it is the case that the Metermaids are not funded by the Gold Coast City Council and in fact following the disbanding of the Surfers Paradise Chamber of Commerce that had taken over the Progress Association’s management of the “Courtesy Maids” in the early 1990’s, the iconic golden girls have been privately operated. In the late 1980’s and early 1990’s, Roberta Aitchison herself was one of the famous girls and when faced with the prospect of no longer being funded by the Surfers Paradise Chamber of Commerce, decided to take on the “business” of running the legendary brand and then now internationally trademarked Surfers Paradise Metermaids and Gold Coast. In the 1970’s, the Metermaids were made world famous by the then Mayor of the City, Sir Bruce Small, who took the girls on a round tour of Australia, pulling stunts such as dumping a truck load of Surfers Paradise sand in the middle of Bourke Street Melbourne, as a cheeky invitation, and certainly a reminder that Surfers Paradise was a fabulous beach destination for that next holiday. Even today many companies use our image and presence as a subtle reminder of everything Gold Coast. We have opened international conferences for Microsoft, flown on the maiden flights for international airlines into the Gold Coast, spearheaded the campaign for the biggest bikini parade and welcomed contestatnts to the reality show Big Brother. To fund the Metermaids, which by now had become an expectation of tourists, the girls started to ask for donations when their photos were being taken by their adoring tourist fans. 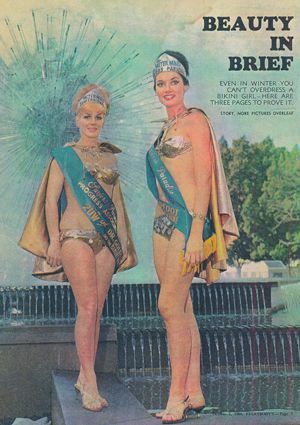 In the past 49 years it is estimated that the girls in the golden bikinis have been snapped by camera’s no less than 3 ½ million times, appeared in thousands of news casts from the Gold Coast and are called upon weekly to promote the Gold Coast as the most identifiable image of this tourist town. These appearances have promoted the fun, beach, bikini and relaxed holiday lifestyle celebrated and pursued by holidaymakers nationally and internationally. It is the case that despite a popular misconception, the Metermaids have never been owned, operated or funded by the Gold Coast City Council or any government body or tourism body of the government. Many people and indeed most companies that approach us are surprised that such an iconic business as the Metermaids has been privately operated since inception. Often businesses simply expect us to attend their functions as part of our role’ believing that we are in fact funded by council or government. In the 1990’s the Metermaids had a retail presence by way of a shop in the now demolished Dolphin Arcade (where the Hilton Hotel and Apartments now stand). From that store, a range of Metermaid merchandise was sold of a what could be best described as tacky and gourdie, yet much demanded by the then tourist. When the Dolphin Arcade was closed for the Hilton development, operations returned to Roberta and Craig’s private residence on Fremar Street Broadbeach Waters, where the current format of the girls being driven into town started. We are now based at 7 Allambi Avenue Broadbeach Waters and operate from a small office which has the dressing rooms and a photographic hall of nostalgia. In the early 1990’s, not one to shy away from controversy the Metermaids tagged themselves with a ‘R’ rating, when then Metermaid’s Roberta and Melinda posed for a centrefold shoot in men’s magazine Penthouse. That decade also saw controversy when, self styled celebrity, former Sydney Swan (AFL) Warwick Capper teamed with the Metermaids as a Meterman, dressed in gold shorts and shirt. Whilst short lived those undertakings remain topics of conversation today, and perhaps add to the colour and notoriety of the brand. These days, a family friendly image is very much the focus of the brand. It is not uncommon to see young men and boys, approach the girls eager for a similar photo with the girls as their fathers, grandfathers and in some cases grandfathers proudly display at home as a memento of their visit to Surfers Paradise. In fact a photo with the iconic Metermaids remains today one of the must-do’s when visiting the Gold Coast. The Metermaids are now synonymous with the Gold Coast and are a unique and effervescent reminder of all that the Gold Coast has to offer. Our brand is without doubt the longest surviving of any business on the Gold Coast, older than the first high rise, for which the town is now well known for, Kinkabool, built in 1968. In 1997, the now famous Surfers Paradise Metermaids calendar, was introduced and sold as a source of revenue to operate the business. Stubby Coolers, bar runners, key rings, t-shirts, coffee mugs and posters have over the years been added to the available merchandise, which is sold to tourists in Surfers Paradise by the girls as they patrol the streets feeding meters.